A favourite recipe straight from my new recipe book - The Caker - Wholesome Cakes, Cookies and Desserts. A deliciously unfussy and light cake with a lovely moist texture. Because of the honey in this cake, it gets quite brown quickly, so just keep an eye on it. Preheat oven to 170°C fan bake. Line a 22cm cake tin with baking paper. In the bowl of an electric mixer, cream the butter until pale, light and fluffy. And the ground almonds and beat in the eggs, one at a time. Gradually add in the flour and baking powder. Fold in the honey, vanilla and rose water, being careful not to overmix. Pour the batter into the tin and dot in the raspberries, pressing down lightly with a spoon. Bake for approximately 40 minutes or until golden in colour, springy to the touch and a skewer inserted in the centre comes out clean. Allow the cake to cool for around 10 minutes before turning onto a cooling rack. Meanwhile, make the cream icing. Whip the cream with an electric beater to ribbon consistency, gently fold through the yoghurt, honey, rose water and vanilla. 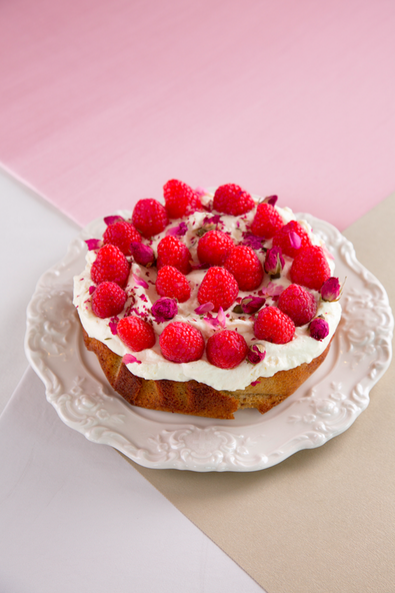 Once the cake is cool, apply a generous amount of the cream icing to the top of the cake and top with some rose petals and raspberries. This distinctively modern hardback book is the perfect addition to your kitchen and coffee table. Inside you'll find 76 seasonal recipes, all with a focus on being wholesome and nutritious - perfect for bakers looking into alternative ingredients and exciting new flavours. It contains plenty of vegan, gluten, dairy and refined sugar-free sweet treats, which are so delicious you'd have no clue they were good for you. Please allow up to 4 business days for delivery of this product within New Zealand.